It is not uncommon to hear of an individual of advanced years suddenly changing his or her will. Despite having had a will in place for years, an elderly person, who is not as sharp as he used to, significantly alters his last wishes. If family drama premeditated the change, it may not be unexpected. Yet if nothing in the senior’s situation has changed, you may have doubts as to why the will was modified or an entirely new will created. 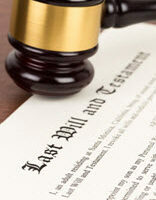 You may even be concerned about another family member, friend, or caretaker’s role in the changing of the will. If your loved one passed away and you continue to believe someone exerted undue influence over him or her, resulting in that person benefiting from the new will, contact our experienced probate attorneys for help immediately. We can represent in contesting the will during the probate process, ensuring another person’s ill intent does not override what your family member would have really wanted. When you claim that another person exerted undue influence over another person, you have a great deal to prove. This is a significant claim. Based on the court case Heasley v. Evans, the Second District Court of Appeals in Florida found that undue influence must amount to over-persuasion, duress, force, coercion, or artful or fraudulent contrivances to such a degree that there is destruction of the free agency and will power of the individual making the will. Mere suggestions to a senior, even if strong and consistent, do not necessarily rise to the level of undue influence. You must have evidence that the other person overcame your loved one’s independent and free will to force a change in the will. The decision in Heasley v. Evans also stated that mere affection, kindness, or attachment of one person for another may not itself constitute undue influence. Therefore, it is important that you differentiate between your loved one being extremely close with another person or clearly favoring a specific person and inappropriate or excessive influence. For instance, it can be difficult to admit that your parent has a favorite child. However, the close relationship between your parent and sibling does not mean your sibling has unduly influenced your mother or father in the creation of his or her will, even if the will heavily favors that sibling. Has a substantial benefit under the will. It can be difficult to prove the three elements above, and Florida courts have laid out guidance on how to do so. However, it is not helpful or efficient for you to learn this all yourself. Instead, contact us at the Law Offices of Larry E. Bray, P.A. to learn more about proving undue influence in a Florida probate court. We have the knowledge, years of experience, and track record of success you need.